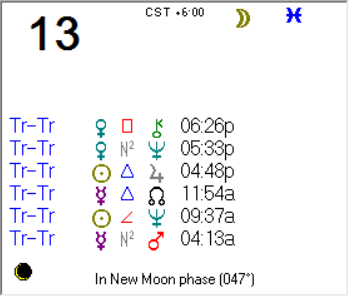 Tuesday, Venus Trines Uranus shortly after the Moon moves into Pisces ending a somewhat long void for the day. This strengthens the possibility of what others consider to be an “unusual” relationship, including the “age gap” relationships we have been discussing since last Friday. It is a good day for creativity, particularly innovation in electronics and computers. The Moon v/c coupled with Mercury Retrograde may indicate the need for re-do’s and later “tuning,” but much progress can still be made today (if one allows for possible corrections later).